The Importance of maintaining your scuba gear! Being a professional organization, we are responsible for other divers safety on each of our oceanic excursions. Given our clientele of disabled scuba divers, we have to make sure our scuba gear is always operating at 100% efficiency and this means doing regular maintenance. If you are looking for some in depth guides, Diver World has some great guides for buying and maintaining the best scuba gear on the market. Scuba gear maintenance is actually quite simple once you get used to it, and any professional diver knows it can extend the life of your scuba diving equipment by many years. Any dive shop that does not regularly service their regulators or has wetsuits that are in disrepair is not a professional operation you will want to be dealing with. Basic Scuba Diving Equipment Maintenance. The most effective thing you can do to properly maintain your scuba diving gear is to rinse each piece of gear after every dive. You must use fresh water to rise off the damaging effects that salt water can have over time. Salt from the ocean will rapidly degrade almost all materials that scuba gear is made from, ruse metal and eat through most synthetic materials. No one likes getting into a smelly wetsuit or BCD, and by rinsing your equipment you will not only get rid of excess salt buildup, but also wash away all the micro organisms found in the ocean that will begin to live in the materials. Bacteria and small plankton can become embedded in your scuba gear and this can really start to stink after a couple days! The most expensive piece of equipment most people tend to forget is their dive computer! If you go for the best dive computer you can find, then chances are it is made from salt resistant materials, but even those can be damaged over time if you forget to rinse it properly after a dive. 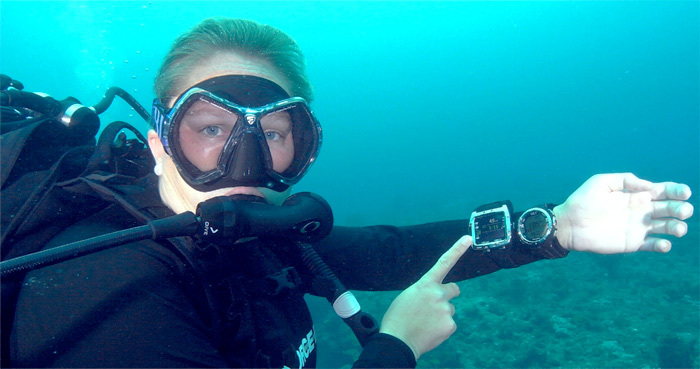 Seeing as most divers wear their diving computer 24/7 on their wrist, this can be easy to forget. 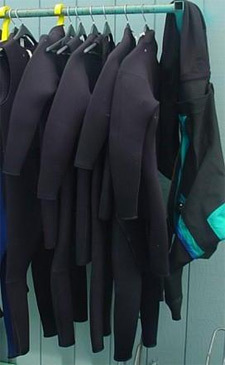 Secondly, after rinsing all your BCD, fins, scuba mask and wet suit, you are going to want to hang them to dry. You should not put them in the sun to dry, as this can lead to damage over time as well, from the UV rays slowly degrading your wet suit and fins. When storing your scuba fins or snorkel gear you are going to want to either hang them vertically, or store them in a flat position. This can stop your scuba fins from being bent over time and helps keep the blades strong. 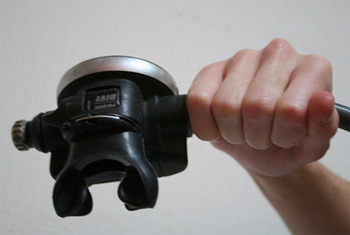 The final piece of advice we have for divers is in regards to your scuba regulator. This is literally your life line under the water so be sure to get it serviced atleast once a year. The membrane in a regulator can become sticky or break down over time, leading to problems with oxygen delivery during a dive, and this can be fatal. Most dive shops will be happy to help you with this, as it can be delicate work and should be done by a professional. Luckily this service is rarely expensive and well worth the investment. So there you have it! A beginners guide to scuba equipment maintenance. If you follow these simple steps your gear should last you for years at a time and many happy dives below the waves. Recently the Handicap-Diving crew has been getting into snorkeling as a way to introduce more hesitant ocean explorers to being comfortable in the water. Being able to float on the surface while taking in the underwater sights is a comforting way to begin to see the ocean differently. All you need is some decent quality snorkel gear, and you are set! being able to breathe actual fresh air can help with many disabled divers who might not be comfortable with the idea of using an air cylinder. Once they are more comfortable with breathing with their face in the water, they tend to be more open to the idea of getting into scuba diving. Snorkeling can be just as fun though, especially if you are on a nice shallow reef. Most of the ocean life can be seen in the first 5 meters of water anyways, so swimming with snorkel gear on can allow you to experience the best the ocean has to offer. Sometimes you can even see small sharks that will be interested in you snorkeling on the surface. It is always an interesting experience to see them swimming up from the deep to check you out, and there is no reason to be scared! with the right snorkel mask and fins, you can move smoothly through the water, while you sip air from the surface comfortably. Snorkel fins tend to be a bit shorter than traditional scuba fins, but a usually snorkel mask is just as good as the best scuba mask. Snorkel sets tend to be handy on most dive boats as well, as it is a fun way to spend your surface interval in between dives. You simply grab your mask and fins and hop overboard! For more disabled divers, they can comfortably float on the surface in a life jacket while still snorkeling and enjoying the views below. This is great for any multiple amputees who have a harder time swimming or controlling their direction while in the water. So hopefully now you can see why we encourage divers of all levels to enjoy snorkeling on their next trip our on the ocean! Happy Travels everyone! Conditions and underwater experiences vary greatly while in fiji scuba diving and while some places are peaceful and great for beginners, most dive sites will enjoy some current, ranging from barely perceptible to extremely strong. It is this existence of current that makes the diving in the Fijian Islands so rich and exciting. Currents are the lifeblood of Fiji’s reefs, starting the food chain by bringing nutrients to both beautiful corals and huge fish alike. Fiji is known as “The Soft Coral Capital of the World” and when the current flows the corals bloom into gorgeous groups displays of splendor. The currents also vastly affect the water’s visibility which can be the best around, with incoming currents bringing clear ocean water into the lagoons and outgoing currents removing any cloudy lagoon water. Lagoons are a feature of the islands and often the water stags shallow until some distance from shore and makes for excellent snorkeling. This means that most of the diving is conducted from offshore boats and also that the shorelines are great for adults and children alike to go snorkeling and swimming. they can even use this awesome Easybreath full face snorkel mask! the scuba diving in Fiji is truly exceptional and one of our favorite spots to bring rehabilitating divers. The local atmosphere is fantastic for anyone recovering from serious injuries. The local population is friendly and you will always be met with a warm smile. so if you are Thinking of visiting this little slice of paradise don’t hesitate to leave a comment and we can get back to you! Handi Capable divers in Barbados! Scuba diving has shown numerous advantages as a social and physical rehabilitation of disabled individuals, allowing them to interact in a near weightless state. many feel that the normal challenges and restrictions their disability gives them on land, disappears in water when given the right equipment and training. It is common knowledge that participating in regular outdoor activities, which involves physical excertion, is rewarded with better health, both mentally and physically. 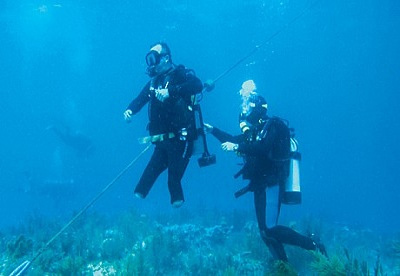 Scuba diving is also a super social sport, and as such can have a extremely positive effect on disabled divers and their ability to interact with non-disabled divers alike. As a diving professional the work with handicapped divers is also rewarding as the students share their excitement and joy of their experiences. For experiend divers and dive centers alike, offering DDI programs can both help them get a leg up from their competitors, but also offer added value to their community and staff. This is why we recently took an awesome trip to Barbados and spent some time under the waves exploring giant ship wrecks with our amazing team. There was so much to see once we all got into our SCUBA Gear and began our descent. There was giant schools of fish and absolutely huge sea turtles. Some of our group preffered to do some snorkeling at the surface and they managed just fine with their mask and fins. Other members decided to go for the full on scuba diving experience and descended to the bottom of the ocean. I was really glad I brought my own personal Diving wrist computer i got on Sale before the trip. I couldn’t wait to test it out and it did not disappoint! George, a double amputee got the hang of scuba diving on his very first try and had an amazing time! infact we all did. There is so much adventure to be had when you become a certified diver, it keeps you busy all around the world. Anywhere there is an ocean you can expect to find us diving there! We even got to see some sharks and help some of our students conquer their fears of these beautiful underwater animals. We even managed to snap some pictures of them with our underwater cameras! All in all this was a superb dive trip that we couldnt get enough of. Barbados, we will be back! Be sure to check out this cool video we found on youtube, to see what it is like down there!